Yesterday for my birthday, I not only had perfect weather - unexpectedly cool and overcast - but as we headed out to lunch, I was greeted with a birthday rainbow. 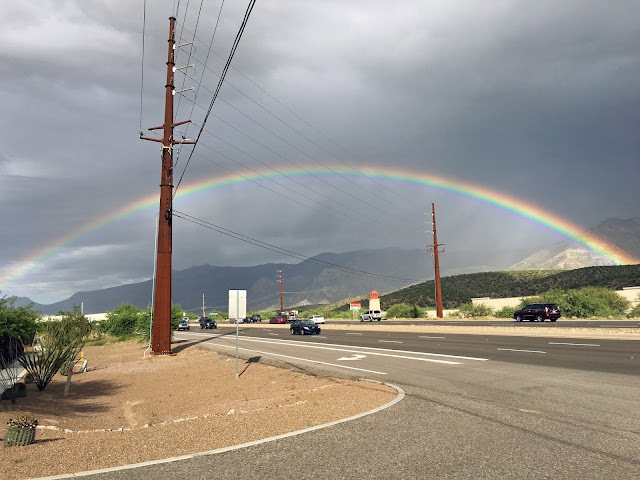 The picture isn't the greatest since it was taken from the car and has all the power lines in the way, but we were able to see the beginning and end of the rainbow. What's not as visible in the photo are how vivid the color is on the far right side where the light is brighter. It looked very cool against the gray sky. It only lasted for a few minutes, once the light shifted, it was gone. Great way to start my birthday.